Oil on masonite. 48" x 48"
George Ames Aldrich , American (1872-1941). ​George Ames Aldrich was born in Worcester, Massachusetts. He studied art at the Art Students League, MIT, and in Paris at the Academie Julien, and Colarossi Academy. Aldrich became a successful and respected etcher and painter. His studies in architecture at MIT is reflected in the buildings and houses in many of his landscapes paintings. Aldrich painted extensively in Europe early on in his career and in later visits. In 1918, Aldrich arrived in Chicago and became involved with the South Bend, IN art scene during the 1920s. Aldrich traveled and painted widely in the 1920s, going both west to the Great Plains and east to various New England coastal locales. Aldrich exhibited regularly at the Art Institute of Chicago, and was a member of the Chicago Galleries Association, the Hoosier Salon, and the Chicago Society of Painters and Sculptors. Both in Indiana and in Chicago, Aldrich's reputation was at its height in the late 1920s and early 1930s. He won a host of awards at the Hoosier Salon, the Art Institute, and the Chicago Galleries Association, where he was featured in a solo show in 1927. The following year, the City of Chicago purchased one of his large Gloucester, Massachusetts, harbor scenes for its municipal art collection. 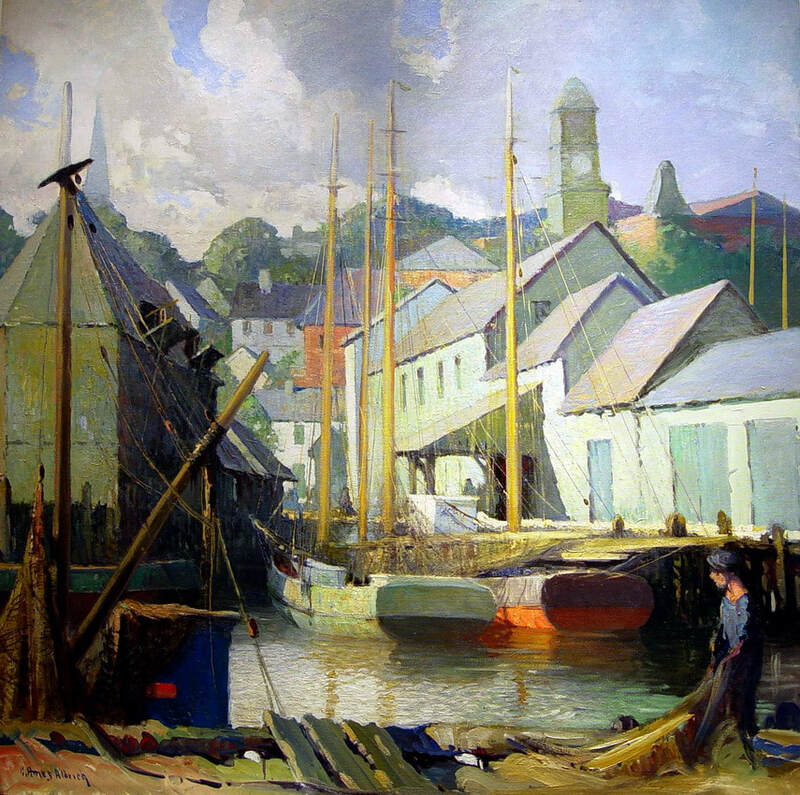 In this scene, from his early East Coast period, Aldrich captures a large scale glimpse of the working docks of Gloucester Harbor. Several wooden Eastern rigged draggers provides a colorful foreground to this painting while the town hall with its clock tower can be seen to the right. The dynamic figure in the lower right emphasizes the dramatic perspective the artist employed in portraying the bustling energy of Gloucester's docks. George Ames Aldrich's work is represented in many museums throughout the world, including the Museum of Fine Arts, Boston, Purdue Universisty, the Musee de Rouen, France, as well as the Union League of Chicago and the War Mothers Building in Washington, DC.